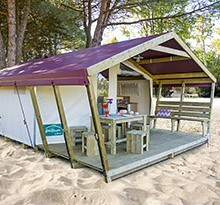 Exclusive to Flower campsites, spacious, modern, fun, welcoming and, above all, original. 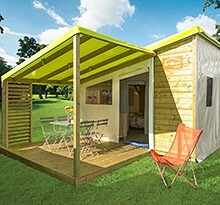 Words just can’t describe the character of the Freeflower, camping’s first all-canvas holiday home. Designed in contemporary colours, it offers 37m2 of living space guaranteed to keep you in touch with nature. No more cold, impersonal materials, no more barrier between inside and out, just the warm touch of the canvas walls and roof and all your favourite creature comforts. The experience of staying in a Freeflower is so far removed from the dull routine of everyday life that even the most ardent defenders of the static caravan will be unable to resist its charms. Just undo the giant zip and rucksack-style clips to transform your dining room and spacious terrace into one huge living area. 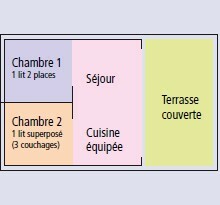 Cook inside and eat outside, or the other way round, with this flexible living space. Fully furnished and equipped with coffee maker, toaster, micro-wave, fridge and all the comfort of proper beds. Freeflower’s charm lies in its clever combination of canvas, carefully chosen furniture and modern fixtures and fittings. Thanks to the giant zips, the bedrooms open on two sides. What better way to enjoy your siesta than lulled by a gentle breeze… Two separate bedrooms guarantee privacy for parents and older children, while the tie-back partition means you can keep an eye on babies and toddlers. 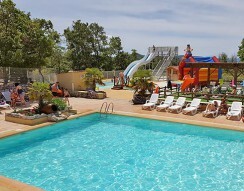 The particular model of Freeflower on offer in a given campsite will reflect the character of its manager. But while the colour and mood may change, you will always find the same high standard of quality. That’s the personal charm of these charming holiday homes! The freeflower 40 m² comes in two models: with sink and running water / without running water. There is also a smaller Freeflower model of 30 m². Warm, vibrant colours: cassis-bilberry / kiwi-banana. 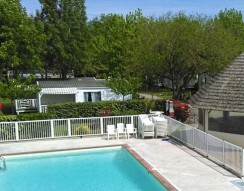 - Comfort: 2 bedrooms with real, comfortable beds and a well-equipped kitchen complete with sink and fridge. 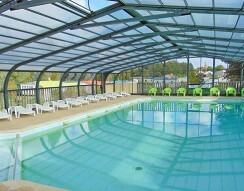 Also available with bathroom (large shower and toilet). Watch our new Freeflower video. Watch our new Funflower video. There’s so much to see and do here in the Pays de Forcalquier. The site enjoys a lovely location close to the coast, ideal for a camping holiday in the fresh sea air. 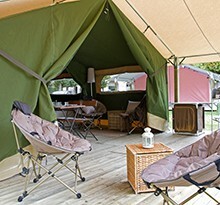 A country campsite set on the banks of a large lake surrounded by leafy parkland. 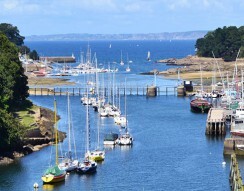 Located in a little corner of paradise in Douarnenez Bay, the campsite makes a great base for exploring the area’s rich cultural, historical and maritime heritage. 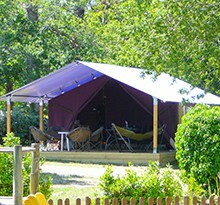 Close to Lacanau in the Médoc, this Gironde campsite offers the promise of peace and quiet in a warm and sunny setting. At the foot of the Jura mountains and close to the Swiss border, marvel at the wonderful landscape of the Lac de Vouglans. The beach with its blue and white bathing huts, the fishing towns of Yport and Fécamp and the famous Needle Rock at Etretat, all bathed in the extraordinary light of the Normandy coast. 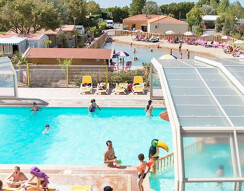 A great base for exploring the sights and sounds of the Hérault, the campsite is located far from the hustle and bustle of the coast yet just a 20-minute drive from the beach.